It’s almost Christmas!!! Are you ready? I am not lol! At least I am getting my baking done and this recipe cannot be simpler. It’s that time of the week again, the Cookies Series from Dana and I where we each share an amazing cookie recipe perfect for you to bake this holiday season. 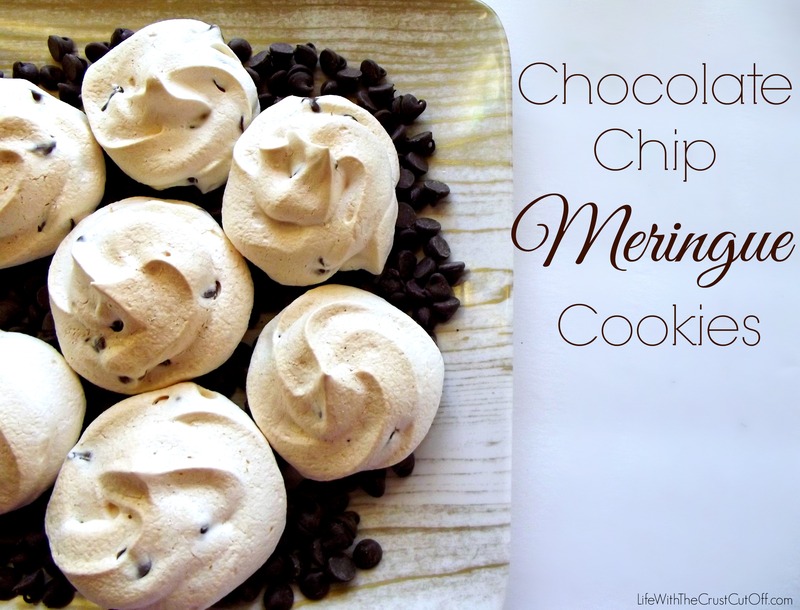 They are so simple to make and you can flavor them a variety of ways, this week I am sharing a Chocolate Chip Meringue Cookie Recipe. These cookies are crispy and just melt in your mouth literally! All you need is 4 egg whites, a little cream of tartar and sugar and you can make amazing meringues too! So get out your mixer and whip up a batch of these for your next holiday get together and you will impress everyone I promise! Though I must say the drawback of making these is you will not be able to stop eating them! My family actually fights over crumbs of these cookies! So try them for yourself you will love them!! Beat egg whites in large bowl with electric mixer on medium speed until frothy. (If using a freestanding mixer, use wire whisk attachment.) Add cream of tartar; beat until soft peaks form. Increase speed to medium-high. Add sugar, 1 tablespoon at a time, beating until sugar is dissolved and stiff peaks form. Beat in extract. Gently stir in chips, if desired. Drop by rounded measuring teaspoonfuls about 1 inch apart onto 2 large foil-lined baking sheets sprayed with no stick cooking spray. Looking for more holiday cookies? Check out Dana’s Red Velvet Sandwich Cookies with Cream Cheese Frosting! Yummy! Check out our cookies from the last weeks! I love making meringue cookies. They are SO yummy! Thanks for sharing at Simple Supper Tuesday. These look great! 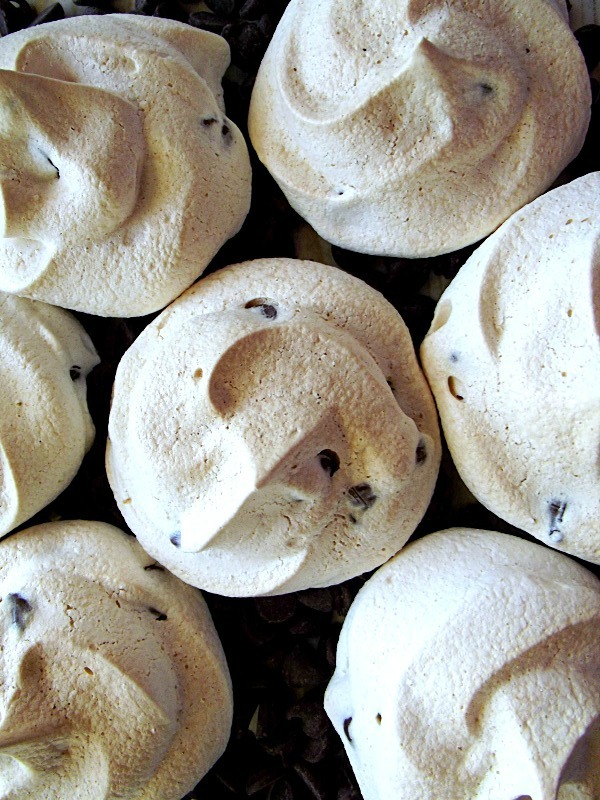 I’ve never made meringues before, but I love eating them. I guess I didn’t realize how easy they were to bake! Definitely pinning. Stopping by from Ducks ‘n a Row and I must try this! These look delicious – and super easy! Thanks for linking up at Whatever Goes Wednesday last week. This was the most viewed link at last week’s party, so we’ll be highlighting it at tomorrow’s party. We hope you’ll stop by and party with again this week! These look absolutely heavenly! I love the way meriingues melt in your mouth. I might put mine on top of some chocolate mousse! Wow these look so beautiful and tasty!! Thanks for sharing!!! Thanks for joining us at Marvelous Mondays, pinned to my MM board! 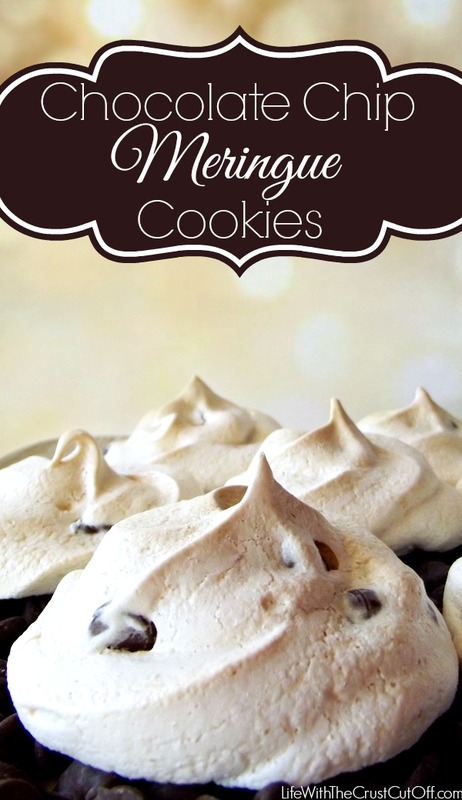 Meringue cookies are one thing that I have never tried to make but I want to do it this year. Love the chocolate chips in these!!! I Have a question for when these are cooling in the oven, should the oven door be cracked at all? These look amazing by the way. Thank you. I just made these for the first time and they are currently cooling in the oven. They are flat. What did I do wrong? Oh no! I am so sorry to hear that! One cause could be the egg whites weren’t whipped enough and another is that they could have been whipped too quickly causing larger air bubbles that then deflated. Don’t give up! I have been looking for a cookie to make that fits my Wellness Wins lifestyle! I’ve released #44 pounds since September and do not wish to carry anymore for my love of Christmas cookies! I modified the recipe to use all powdered sugar because it is -19 points per batch (I doubled) so got 70 cookies! Still in oven so I’ll have to come back and tell you how they taste! These are one of my favorite cookies. I like to use mini chocolate chips and sometimes I add finely chopped pecans too. Oh yum.